This wealthy suburb of Chicago, named after a natural spring in the area that was believed to have healing powers, once belonged to the Pottawatomie Indian tribe. Subsequent Quaker settlements turned the village into a quiet community that banned both alcohol and tobacco. 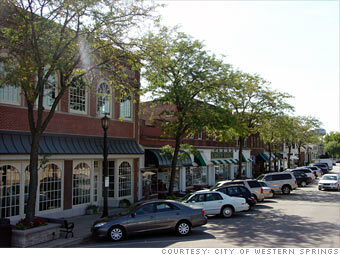 Western Springs is still a quiet, family-friendly neighborhood, favored by professionals like lawyers, doctors and engineers. The area's historic sections feature million-dollar Victorian style homes although many older homes have been torn down and are being replaced by elaborate custom-made houses. Country clubs, numerous neighborhood parks and a nationally-recognized theatre school complete this playground of the rich.